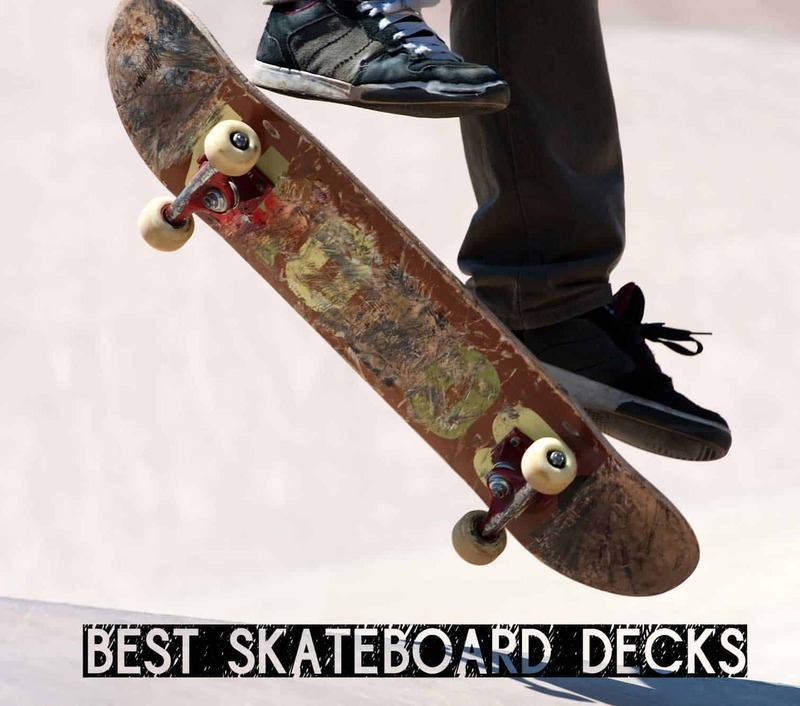 10 Best Skateboard Decks in 2019 For Street, Pop And More! The 10 Best Skateboard Deck Brands in 2019 For Street, Pop And More! Top 10 Skateboard Decks – Updated 2019! 3 Best Skateboard Decks Brands Reviewed! A skateboard deck is the piece of wood balanced on your wheels that you stand on. It is the most visible part of your skateboard. When it comes to buying or choosing decks, not everyone even knows what to look for, especially if this is your first skateboard. Which is why a lot of people end up just buying bad cheap decks that break very easily. To help you select the best skateboard deck we have prepared this list with complete guide so you can get the right one. Consider the amount of brands available out there, each brand provides several options to choose from, then you have to match this to your own preferences as a skater, based on your own style, skills and terrain preference. This isn’t a decision to be taken lightly, a lot of thought should go into choosing your skateboard deck and though the decision is yours to make, I will help you make a well informed one based on experience and research . So stick with me as I cover a few fundamentals and reviews. Now I am going to reveal to you the top 10 skateboards with the most pop. These are the ones to keep your eye out for and I will provide honest reviews on a couple of them, based on the benefits and features of the skateboard decks. For newbies, you might want to be certain about the main purpose of your skateboard. The narrower the board, the easier it is to do flip tricks and manoeuvres, so if technical street skating is your thing, then this is the better option. A narrow board is also better for you if you are a small sized skater or have small feet. On the other hand, if you rely on skateboards as a means of transportation , then you want a wider board. Wider boards will give you better balance and stability and are also better for you if you are a large sized skater or just have large feet. The most popular skateboard deck sizes found in the shops range between 7.5” (19cm) to 9.5” (24cm) wide. The type of skating you do determines what width to choose. When you are starting off it is better to go with a wider deck simply because first you will have to learn balance and wider decks are best for it. Once you are confident in your riding skills you can go ahead and switch to narrower ones to start ramping. If you start with a narrow board, get confident to move on to a wider one, you would begin to notice the difference. You can catch flips a lot easier on a wider board but they’re harder to flip and you get more leg room. The most usual length of a skateboard deck is in the range of 28″ and 32″. Any longer than 32” and it would be classified as a longboard. To get the correct length you measure from one end to the other end, also known as measuring from the nose to the tail. At one point the longer boards do turn into longboards, which are used for completely different purpose and cannot be categorized in skateboarding. Shorter boards are more likely to be narrow and longer boards are more likely to be wider, therefore the same principle applies from the width discussion. The narrow boards will serve you better for tricks, the wider boards will be more appropriate for transportation. As a first time buyer, avoid buying a cheap skateboard. The deck of a cheap skateboard is more likely to be of poor quality. It can be made of flimsy wood and just give you an overall awful skating experience. Making a good investment at first will help you for a long time and it simple math. If you are buying cheap boards again and again or buying one good board once? Simple math. This ranges between 13” and 15”. It is the measurement of the distance between the two sets of mounting holes drilled into the deck for the trucks. Your height comes to play in this. The taller you are the wider your wheelbase should be, this enables you to widen your stance while skating. Depending on the skateboard wheels set you have this will matter accordingly. Materials most commonly used to construct skateboard decks are laminated sheets or veneers of hard North American maple, a durable and somewhat flexible wood. Typically, skates are formed using a 7-ply construction, where seven veneers are layered on top of one another, but there are several companies that offer fewer or greater plies to decrease weight or increase strength. Pop refers to how responsive a new skateboard deck is. When a skateboard is new, the nose and tail edges are precise and the grip tape grips your feet strongly, enabling you to pop an ollie higher and with less effort than an older deck. The skateboard decks with the best pop are made out of bamboo. Modern or New School Decks: This is by far the most common type of deck. It is a symmetrical shaped deck which gives the skateboard versatility, this means it can be used for any type of skill, trick or function. It is great for all levels of users. Old School Decks: Originally, a wider and stable type of deck which over time became narrower. The hole patterns for the trucks were also changed to adapt to tricks done on the nose of the deck. Best for bowl skaters who do not do ollies much and prefer to carve and go fast. Freestyle: Symmetrical and kind-of-square shaped decks used back in the early eighties to do a different type of skateboarding, involving flips done on flatland. The freestyle and old school deck styles were combined to make the modern decks. Longboards: A longer length of deck best for going at high speeds. Although easily confused as the same thing, the longboard culture is different from skateboarding culture. A skateboard can be bought in either of 2 ways. It can be bought with a blank deck or branded. A blank deck is exactly as described. It is blank. No graphics. Just a skateboard in its raw form. No company identity or branding ( we would be reviewing a blank deck further down in the reviews’ section). Sometimes, they are made by struggling entrepreneurs who do not have the resources for flashy or fancy graphics, in those cases, the skateboard decks can be bought for really cheap and i suppose you could sleep well at night knowing you have helped out “the little guy” being pushed out of the market by corporate giants. However, many of them are sold without an identity or any sort of information, then you can’t tell how it was made, what materials were used or how they were sourced. It could break within 5 minutes of your purchase or worse when you are riding it and it decides to break, you better be wearing a helmet. If you decide to get it and it breaks oh well, you only got it for $5 anyway, right? On the other hand it might as well be the best board in the world and last you for generations. Blank decks are a gamble. In many cases, blank decks are just so because there is a market for it and the corporation decides to provide this good to meet those needs. Buying a blank deck is a personal choice, perhaps it is because you want to personalize it by making your own graphics, or perhaps you just do not like bright colors and want to keep things simple and build it from the ground with your own skateboard bearings and hard work. A branded deck is the opposite. It has the maker’s logo on it together with all sorts of graphics and necessary information to help you decide whether it is a good quality skateboard worthy of its price or not. What if the information provided regarding quality is false or exaggerated? You still end up with a bad skateboard which you have paid a lot more than its worth for. All skateboards end up with faded graphics, so, how important are the graphics anyway? Having anything at all for the first time, yes even skateboards, means you are bound to encounter some problems that would affect the performance of your skateboard. Some problems are common and some aren’t. Not being able to get a grip: If your feet isn’t gripping to the skateboard deck, it is probably because you need a grip tape. It is unadvisable to skate or stand on your deck without a grip tape. So you need to go and get yourself a grip tape. A soft, bendy deck: this can occur if your skateboard is of poor quality, but if a soft deck is a recent development on your skateboard then you have to check it for wetness. A wet deck will reduce your skateboard’s lifetime. Try not to get caught out in the rain often. Lack of control: If your skateboard keep slipping from you, you are probably standing on the deck the wrong way. You need to learn the proper foot placement to control your skateboard, otherwise you would never have control of it and your ollies will continue to get away from you.Get more information on the proper foot placement for an ollie here . Reduced pop: If your skateboard isn’t popping as high as it used to , it might mean you need to replace the deck, or get new grip tapes. Skateboard feels difficult to maneuver : you might have bought the wrong deck length. Buying the right length allows you to stand on the deck, reaching the nose and tail with your feet, an ideal position for maneuvers and tricks. Skateboard feels unstable: you might have the wrong width. The right width provides balance. Unable to do stalls and slides properly: probably because the nose and tail of your skateboard are the wrong lengths. Without the right measurements, you would not be able to do stalls and slides properly. The nose has to be slightly longer and raised at an angle for nose tricks and to let you get used to riding it the same way. These skateboard decks are made from the high quality bamboo and guess what, they are made by a company called Bamboo. Great marketing ! Although this brand isn’t one of the most popular in the community, it has actually existed for a while now. Whether you are a beginner skateboarder, beginner longboarder a pro skater looking to try something new, you should really consider giving them a try as their products are very impressive. This is because bamboo made skateboard decks are usually better because they have the best pop and result in a longer lasting and highly performing skateboard. In terms of physical looks, this skateboard deck has a unique green fish graphic and the nose has a regular U shape but the tail is short, giving it an odd shape. The concave is deep for premium control while riding, doing tricks, and taking hard turns. Although, advertised as a pro-level skateboard deck, this deck actually suits most skill levels, even beginners. Construction : 100% bamboo decks are flexible, they can snap more easily, but this deck is a hybrid construction of maple and bamboo, with the maple placed in the middle layers to make it sturdier and more solid than an average deck. Where typical skateboard decks are made with 7 plies, to reduce the bulk and to make it lighter, this one has been constructed with a hybrid formula of 6 ply bamboo and maple wood which improves the board sustainability. It is light but solid. -It can take a whole lot of abuse and still be intact, it is very forgiving. The bamboo fibres gives -it a different kind of protection so that damages from everyday usage are not obvious. -It can last for years and still hold up nicely. -It is best for avid skaters, those who go through skateboards easily from heavy usage. The odd shape of it throws some skaters , some people just prefer decks with identical nose-tail. Personally, I think the best thing about this skateboard deck is the brand itself. The Mini-Logo brand is huge, it is very popular and well loved by skaters. The company has existed for ages and they’ve only gotten better over the years with their amazing skateboards and accompanying accessories. It would be difficult to find a shop who does not stock this brand and you can not search google for skateboard decks without the Mini-Logo brand popping up. This is the reason this skateboard makes it to the top 3 review. Construction : A traditional style 7-ply maple construction. -Great overall quality, they last forever and barely chip. -Stiff, sturdy decks with a medium concave that is not too deep or too flat, as you really do not want a soft or bendy deck. -They are built to take a lot of abuse, whether it is from beginners still trying to find their style or pro skater who pound the decks hard. -They retain their pop for much longer. -It actually gives you an enjoyable skating experience, your kickflips and high flips just seem more awesome with this brand of deck. -They are very affordable because they don’t use graphics and pass the savings onto you, the customer. For the price, this is one of the best decks in the market. -Great shape that really helps lock in grinds. It has the right balance of nose-tail. Very size accurate, as not all companies are accurate to their deck’s sizes. What is not so great about them? Their forte isn’t graphics, so their graphics do not last. The concave on it is medium which makes it perfect for beginner tricks and it is available in an 8” x 31.5” size. Construction: The manufacturers have layered 8 plys of maple for strength. It is made out of 100% Canadian maple which is actually stronger than American maple and it is reasonably priced. -It is made of natural maple wood so it is fairly strong and sturdy. -This deck is great for customisation, you can paint it and draw your own cool graphics. -It can not take as much abuse as some other brands in the market, so you might want to consider getting yourself another deck as soon as you see yourself improving and no longer a beginner. – Due to its unusual 8-ply design to make it strong, the knock on effect is a heavy deck that might be too rigid that it can easily snap. -Its heavy weight makes it hard to flip. 1. The deck is cool, but what about them sneakers? Check out our pick for best skateboarding shoes. DGK’s Rap Gods range of skateboard decks. These signature skateboard decks have some super awesome graphics dedicated to famous hip-hop rap artist with their saint-like designs. Rappers featured on the decks include the late Notorious B.I.G (ak.a. Biggie Smalls) and Big Pun. This is one of the coolest graphics you would find on skateboard decks, which I discovered can be a source of inspiration to skaters. Another awesome skater deck to check out for pop and cool factor is the Mountain Bomber Skateboard Deck from Flip. Its high flying graphic and explosive design is completely out of this world and the deck is perfect for every skill level. This is a totally versatile skateboard deck that’s perfect for street, pool, park and vert. It’s rock-solid with tons of pop and ready for a staircase near you. The choice is yours, I have helped you with your research but if you are still feeling unsure about what skateboard deck is right for you , it might be worth it to make a trip to a physical skate shop, rather than an online shop, even if you end up buying it online because it is cheaper. At a shop you would definitely get a feel for what is a good price and what deck feels right. Maybe even try standing on a few and make sure you are comfortable. During this induction phase, you would eventually notice what other skaters are using and it would help you make a better skateboarding budget and choice.